Yesterday was the season opener for the 2017-2018 deer season here in NC. After an empty morning sit I went back into the woods at about 4pm. At about 7:05pm this fellow came along a trail that I thought would be productive. 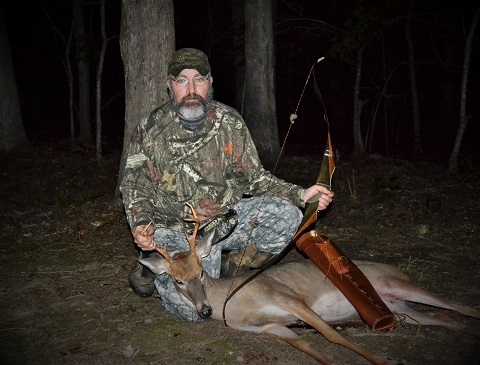 A special thanks to Duke Grimstead (slim_grim - my son-in-law) for driving the 1.25 hours to Rockingham County from Randolph County to help me track this deer and recover it. The uphill drag out of the woods was much easier with his help. I used a vintage 1972 Bear Archery Super Kodiak recurve 45x @ 28 with a Gold Tip Traditional 500 carbon arrow tipped with an 80s vintage Bear Super Razorhead broadhead. I wasn't sure of the hit. It was quartering away and the hit was a little low, but high enough to hit several vitals and ensure a quick and humane death for this guy. Entry behind the ribs on the left, exit was just behind the front right leg. I heard every step of the final run and I heard the deer fall, but wasn't sure if it had tripped or was down for good. I waited for Duke to drive up to help, just in case it was going to be a long trail. As it turned out the fall I heard was the resting place of the buck. He was gone in less than 30 seconds. I am thankful, very thankful, for the swift end. Very nice deer, congrats on the harvest. Congrats on a fine buck and short tracking job! Even better with the vintage equipment! Been down here in SC for a year now. Need to get out and look for a place to hunt. Hopefully next season I can make it happen. Lots of WMAs there. Some are hunted very little during bow season. Check WMAs near Santee Cooper. But wait for Irma and Jose to pass. Great Day - nice buck and great shot placement! Good job Bud! I don't usually miss opening weekend, but it was following the full moon. I'm such a wonderful husband I normally only go up to the hunting grounds every other weekend, so I'm waiting to get synced up with the quarter moons this weekend. P.S... you don't need to try to corroborate that statement with the missus, lol! Excellent, now take the next one with the '65 Kodiak that you got from me. The same arrow shoots just as well out of the '65, Dave. Will try to oblige you on that.